Swieta Lipka is a tiny village in the north of Poland, and despite its size it is well known – as a religious centre and a pilgrimage site. In fact, it is one of the most celebrated in the country. Whether you are a Catholic or a tourist with an interest in sacral architecture, this is a destination you have to see. Within the monastery complex stands a magnificent 17th century Baroque church of the Blessed Virgin Mary, where organ concerts invariably draw large audiences. Scenic Lake Dejnowa and its environs help make Swieta Lipka a mini health resort. 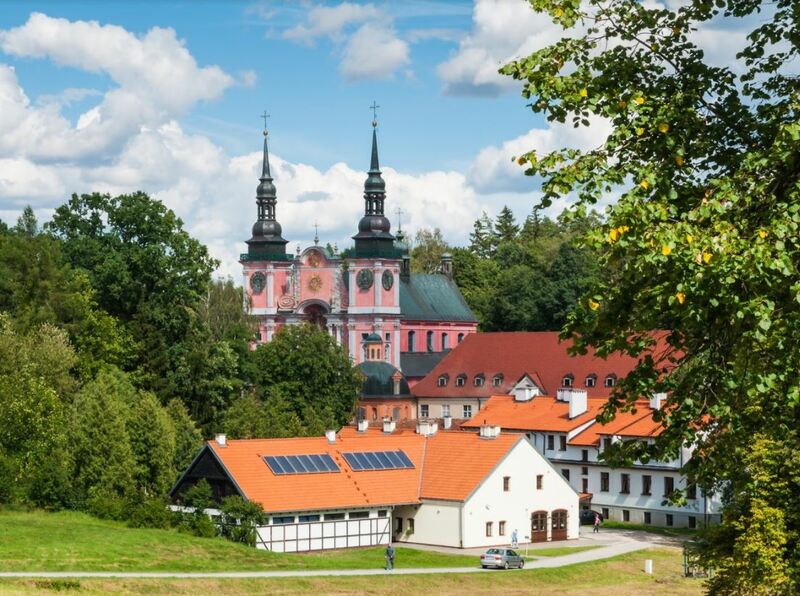 Regarded as one of Poland’s greatest works of Baroque architecture, the famous Marian sanctuary in Swieta Lipka annually attracts huge numbers of tourists and pilgrims alike. The entrance to the basilica is via the arcaded cloisters and contains an ornate wrought-iron gate and four corner chapels. Inside you will see that the church boasts a stunning interior with the works of many remarkable artists. Among these masterpieces is an 18th century trompe l’oeil ceiling polychrome by M. J. Meyer as well as a splendid high altar by K. Peucker that includes a B. Pens painting showing the Virgin Mary dressed in a silver robe. But the church’s most famous feature is the Baroque organ, built in 1721 by Johann Mosengel from Konigsberg. A work of art in itself, it has a set of statues such as an angel playing the mandolin and cherubin with bugles. And what is more, you can watch the figures moving while the instrument is being played. Organ concerts are held in the summer months every Friday at eight p.m.
Not far away, near the road through the forest is a former a border stone with a statuette of Holy Virgin on it that once marked the border between Poland and Prussia. Swieta Lipka is situated in the Warminsko-Mazurskie voivodship, about 70 km to the southeast of Olsztyn. The village nestles between wooded hills roughly halfway between Ketrzyn and Reszel (6 km to the southwest of Ketrzyn and 6 km to the east of Reszel), in a valley occupied by two lakes – the Dejnowa and the Wirowe (Wierzbowe). Once upon a time a criminal awaited the carrying out of his death sentence in the dungeon of Ketrzyn Castle. He prayed to the Holy Virgin to save him, and on the night prior to his planned execution she revealed herself to him, and gave him wood and a chisel so that he could carve her figure and then present it to the jury the following day. The convict obeyed her words and though he had never carved before he managed to produce a fine statuette of Mary with Child. Believing this to be a sign from God, the judges let him loose. The grateful man placed the statuette on the first linden by the road from Ketrzyn to Reszel. Before long it gained fame as a miraculous object. The locals carried it into the church in Ketrzyn, however the statuette vanished twice and returned to the linden, irrefutable proof that the Holy Virgin had chosen the location. A decision was soon made to erect a chapel there. Enough of the legend. According to ancient books, the first pilgrims came to Swieta Lipka in the 13th century. “Lipa” is the Polish name for the linden tree and “lipka” means “small linden tree”. A chapel was created here in the 15th century, to which the Great Master of the Teutonic Order, Albrecht von Hochenzollern, paid a visit in 1519 on bare foot. The situation was reversed around the year 1530, when the same Hochenzollern became a Lutheran. He then ordered the destruction of the chapel and the statuette (it was dropped in Lake Wirowe), and the cutting down of the Holy Linden. The Catholic faith was banned in the Prussian state and its priests were exiled. Since cult of the saints was forbidden as superstition, pilgrims to Swieta Lipka received the penalty of death. In 1618 the Catholics regained their religious freedom, the secretary to King Zygmunt III Waza bought the whole of Swieta Lipka, and the village was turned over to the Jesuits. Surviving to this day, the superb baroque church in Swieta Lipka was built between the end of the 17th century and the mid-18th century, on the same spot where the Holy Linden once grew. 12 days | Special deal available!